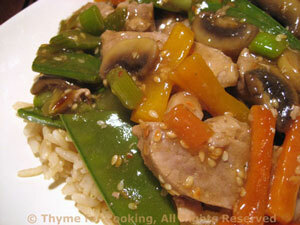 Stir-Fried Pork with Snow Peas, Thyme for Cooking easy main course. Snow Peas are traditional in Asian stir-fries. They stay crisp and green, adding both texture and color to the dish. Melt butter in small saucepan over medium heat. Add rice and sauté, stirring for 2 - 3 minutes. Add stock or water. Cook rice for length of time on package. When done fluff with fork. Cut the pork into strips bite-size pieces. Add onion, pepper, carrot to skillet and stir-fry for 2 minutes. Add garlic and stir-fry another 2 minutes. Remove onion/pepper/garlic from pan and set aside. Add sesame oil to pan and heat. Add pork and stir-fry 3 - 5 minutes, until nicely browned. Add snow peas to skillet and stir-fry 1 - 2 minutes. Return everything to the skillet. Dissolve cornstarch in soy sauce. Add cornstarch mixture to pan and stir until thickened.